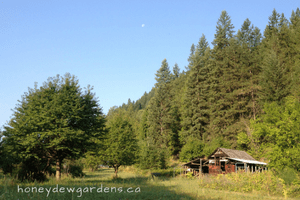 With a sunny disposition and a gentle slope, Honeydew Gardens is nestled up against Mt. Sentinel in the Selkirk mountain range in the West Kootenays, BC. Located in Thrums, we are just 10 minutes from Castlegar and 25 minutes from Nelson. Moving from rural Saskatchewan in 2015, just a hair shy of “the north” we brought with us a dream and a passion for growing healthy food. We believe in living and gardening in harmony with nature. There’s no use of chemical fertilizers, pesticides, or any -cides for that matter! Instead, by focusing on the health of the entire site and inhabitants on our little farm, we are growing a healthy, sustainable farm to supply our local community with fresh, healthy food! We produce a seasonal market garden abundant with fresh veggies, herbs and fruits, as well as pastured pork, poultry & eggs. The abundance of fresh air and sunshine is obvious in the delicious taste! We took the official leap with 2017 being our first year as “your farmers”. Our passion for tasty & nutritious low-mile food is the reason why we grow for you!